If you live in Davis County, Utah, you know about Cutler’s Cookies. We have lived in Bountiful for close to twenty years and have had the pleasure of being a Cutler’s customer for as many years. I’m honored to be the only blogger Curt and his wife Nancy have worked with in sharing recipes both in classes and online. Every time I post one of their recipes, people from near and far away comment about craving one of their signature sugar cookies. Cutler’s Famous Glazed Sugar Cookies (step by step) are soft, puffy, perfectly shaped and always frosted with either a generous amount of buttercream or topped with a glaze, flavored with a hint of almond. I originally posted Curt’s recipe for Sugar Cookies with Butter Cream Frosting here, and later added the glaze recipe to the post after numerous requests. Since there were so many requests about the glaze, how to make it, how it is applied, etc., I thought you might like to see the method Cutler’s uses to glaze the cookies a whole pan at a time. Their secret is a stainless steel pan you’ll find in the hardware store. It looks like this and costs just a few dollars- some call it a trowel pan or a spackle pan, I think it looks like a mini-trough. Curt came over last week to show us step by step how the glaze is applied. We baked up some cookies he made in the Cutler’s kitchen and also mixed up a batch in the Bountiful Kitchen. Melanie (quality control specialist and bff), my daughter Corrine (who took most of the photos so I could get busy with the flour) and the cutest grand baby you’ve ever met, Anabelle, aka: Yanners, Yani, Yippers, The Yiplet(advocate for anything pink, sparkly and sugar filled) were on hand to join in the sugar fest. Cathy, cookie making expert from Cutler’s, also joined in the fun. Frosting or glazing the cookie is a matter of preference. Some are buttercream frosting fans (me). Some are glaze fans (me again). If I have to choose just one, I’m going with buttercream every time. But after eating these glazed cookies fresh out of the spackle pan, I must say, I’m now a glaze lover too. Here’s a step by step from the Cookie King himself, Curt Cutler. Step one. Get all of the ingredients together. remember that part about generously flouring surface? After baking, remove from oven and let cool completely. Make the glaze according to recipe and fill the mini trough with glaze. Double the glaze recipe if you are using the trough, so you will have enough glaze to cover all of the cookies. This is the method Curt uses to cover all of the cookies at one time. Thanks Corrine, for making this Gif file, so we can watch it over and over and over. isn’t this a thing of beauty? If you don’t want to purchase a spackle pan, you can simply mix up the glaze in a bowl, then dip the cookie and gently scrape the excess icing off before setting it on a pan to set up. The next few photos show us dipping the cookies in the glaze by hand. hurry and throw on some sprinkles before the glaze dries! That’s it! Very simple, really. With or without the mini trough. Of course, the easiest way to enjoy a Cutler’s Cookie is to hop in the car and drive over to Cutler’s and get your cookie fresh from theirBakery. Call them to place your order early (801) 298-2253. Valentine’s Day is one of their busiest days of the year. Curt and crew sell about 300 dozen (3,600!) heart shaped cookies the week of Valentine’s, not counting the pink frosted or other cookies sold there. Baking frenzy on 500 South. Hope your Valentines Day is filled with all things sweet! Cream butter and sugar. Add eggs and vanilla and mix until blended well. Add dry ingredients and mix. To make dough easier to work with, chill before rolling. Roll dough on floured surface to about 1/4 inch thick. Cut cookies and bake at 350 for 10 minutes. Top the cookies with glaze. Makes about 2 1/2 to 3 dozen, depending on the size of your cookie cutter. Place powdered sugar in a large bowl. Add almond emulsion or almond extract to the powdered sugar, along with milk or water, a little at a time whisking to combine. Continue whisking until smooth. Add just enough water to make a smooth glaze that stays on a knife when the knife is dipped in the glaze. Glaze the cookies by dipping the cookie into the glaze in a bowl and removing quickly when coated. Place cookies on rack or cookie sheet until glaze sets. -*almond emulsion is sold at specialty cooking stores (Orson Gygi’s in Salt Lake City) or stores where cake decorating supplies are sold. You may also use almond extract. -** Meringue powder is also sold at specialty cooking stores. Cutler’s uses meringue powder to create a shiny effect on their glaze. It is optional when making the glaze. Or you may use the same amount of cream of tartar in place of the meringue powder to create the shiny effect. I have noticed the shiniest effect seems to come when using the combo of water and meringue powder in the glaze. -If the glaze starts to get too stiff, add a small amount of water and whisk in until desired consistency. I mixed up the glaze, then poured it into a pie plate so we could easily dip the cookies that are covered in white glaze in the photos above. -The hot pink color is achieved through using a food coloring purchased through Michaels or (in Utah) at Orson Gygi. -Make sure to use a clean sheet of parchment paper in the bottom of the pan used to glaze the cookies. if you are using the trough method. After you are finished pouring the glaze over the cookies, you may scrape the excess glaze back into a container and use the icing for a future batch of cookies. Refrigerate any leftover glaze. Si, you and Corrine are amazing! Beautiful pictures and fun way of presenting cookie making! Thank you Cathy! It was fun to spend the afternoon with you. Beautiful photos Si. Is this your kitchen in your new house? Love the baking area. Thanks Bonnie! Yes this is the new kitchen. I'm gong to do a post soon. It has been an awesome kitchen for baking! Lindsay, that is too funny. Thank Heavens for Cutlers! 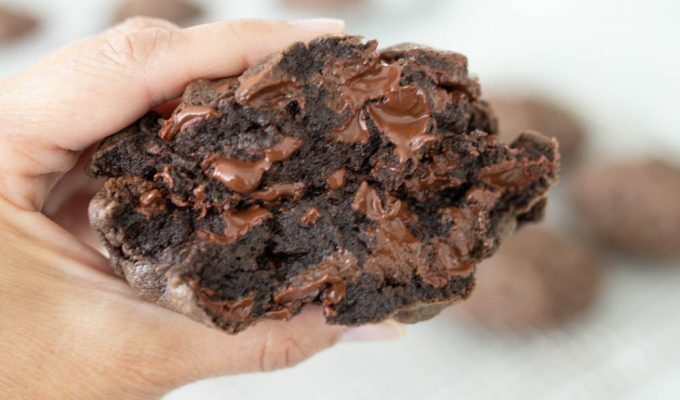 I love to make cookies at home, but it is so nice to drive thru and pick up a cookie when I'm having a craving or don't have time to make my own. And that icing waterfall, the best! Amazing photography work Corrine! I am so good at quality control, they were all perfect. You are the master of beautiful and the best tasting creations. I may or may not visit Cutlers too often. Do you use AmeriColor food gel from Gygi to get that hot pink color? What color did you use? They're gorgeous! Can't wait to make these tomorrow!! Thank you! Living in AZ this time of year is awesome for the weather (I love the sun) but I miss all of my favorite Utah treats and this is my all time favorite! Thank you! Curt cutler and his knife. I love this post! We made these tonight with our kids and we all loved them! Our 8 year old son said “These taste exactly like Culter’s! !” Thank you for sharing the recipe. Not to be a downer, I adore Cutler’s, but… is a spackle tray from a hardware store food-safe? I know it’s what Curt prefers, but there are so many sketchy metals and metal treatments that I’m just crossing my fingers and hoping he contacted the manufacturer and checked what materials make up his tray. On a lighter note, thank you and Curt for sharing the recipe! I am excited to try at home when I’m too far from my local Cutler’s! I wondered the same thing, so I looked on Amazon for a metal bread pan and found a 12” one that I might buy to see if it works. It was listed as “Norpro 12 Inch Nonstick Bread Pan”. I think you could easily do two rows of cookies with that size. As of today, the price is $8.21. What brand of cake flour do you use and where is the best place to buy it? Thanks! It is usually found on the top shelf at grocery stores, in a small box. Most groceries sell ” Softasilk” Cake Flour in a box. Make sure you read the label if you buy other brands and buy Cake Flour and not a “Cake Flour Blend”. If you can’t find cake flour at your grocery, you can make your own at home by using this simple method: Measure out 1 cup of all purpose flour into a medium size mixing bowl. Remove 2 tablespoons of the flour and place back in the flour container. Add 2 tablespoons of cornstarch to the flour in mixing bowl. Sift the flour and cornstarch mixture. Sift again about 3-4 more times. You now have cake flour! Place in a bag or container, measure out and use as needed. We adore this recipe. I have always used unbleached white flour, because I always decide to make these when I don’t have cake flour, and they are still fan-freakin-amazing. This recipe is forgiving too. I’ve often done this heavy handed, with a baby in the other, I’ve used flax seed powder in place of the egg and it still is always a hit. Thank you for sharing this. Thanks for sharing, Andrea. And I agree, this recipe is very forgiving and always turns out delicious!